Do you have a younger brother or sister, or a daughter or son who is preparing for the 11+? Do you know anyone who is preparing for the 11+? Are you? If the answer is yes to any or all of these questions, this book is the perfect thing for you! Here's an exclusive preview of my book, How to get into Grammar School. The full book is now available on Amazon! Chapter 3: It’s not too late! Chapter 8: What’s your weak spot? Chapter 9: How elephantine is your vocabulary? If you’re reading this, it means that sooner than you know, you will be sitting in an examination room taking one of many 11+ exams. If your situation is anything like mine was, you’re feeling pressurised by your parents, your older siblings (who passed the 11+), your extended family, your teachers, possibly even your friends and just about everyone you know. Don’t worry, though, because you’re not alone – most grammar school students have been in a similar situation! Besides, now that you’ve hit the jackpot by picking up this book, all your problems are soon to be solved. If you read this book from cover to cover, soak in all the priceless information printed within these very pages and religiously follow all the suggestions, tips and advice provided, I can guarantee that you WILL get into grammar school. I am really proud of Shireen’s book and I hope it helps you to tackle the 11+ with more confidence. There is a lot of sound advice in it which should help you with any examinations you face in the future. Life is what you make it! Remember that going to grammar school may offer many opportunities, but there are plenty of good schools that are non-selective. If you work hard, do lots of extra-curricular activities both in school and in the community, you will stand every chance of making a success of your life. Above all, enjoy education and enjoy being in school. So you want to get into grammar school? Sadly, there is no easy way for you to pass the 11+, but this book is teeming with state of the art advice that will supremely increase your chances of studying at one of the country’s best schools in the foreseeable future. 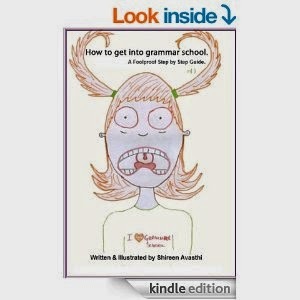 How to Get into Grammar School is a dip-in book and each chapter is as self-contained as possible. You don’t have to read it from cover to cover; you might simply wish to look up a certain topic – the night before the exam for instance. Search for the appropriate chapter in the contents and then turn to those particular pages and bask in all of the priceless information you find there. However, it’s advisable that the first time you read this book, you do read it all the way through in chronological order as that will help you to completely understand all the information. Afterwards, when you visit different chapters at a later stage, you will be able to relate to them a lot more easily. Make sure you read this book with an open mind and feel free to adapt the advice provided within these pages to make it suitable for your specific situation. Why are you preparing for the 11+? Is it because your parents want you to? Is it because your teachers say you should? Is it because your older siblings go to grammar schools? Is it because your friends are doing it? It doesn’t matter how many of these reasons apply to you. The only person that can make you pass the 11+ is YOU. So you’ll only pass the 11+ if you genuinely want to and if you work for it. 1. to get a better education than I would otherwise receive? 2. so that I will have classmates who are interested in learning because they enjoy it? 3. so that I will be studying in a friendly, safe environment? 4. so that I will be taught by more dedicated, enthusiastic teachers? 5. so that I will be able to use better, higher quality facilities? 6. so that I will have access to great extra-curricular activities? 7. so that I will be able to experience all the other terrific perks that come with studying at a grammar school? If you answered yes to most of those questions, you are preparing for the 11+ exams for the right reason - you’re preparing for yourself. If you answered no to all or most of these questions, but answered yes to the questions at the beginning of this chapter, you are preparing for the 11+ exams for all the wrong reasons. You should change your attitude and start studying because you genuinely want to, or you shouldn’t get your hopes up about passing the 11+. With the wrong attitude, your chances of passing the 11+ are minimal. If you are equipped with the right attitude, carry on reading. If you aren’t, take some time to change your attitude and when you’re ready, read on! If you enjoyed this, the full book is now available on Amazon! Wow, this looks really good! I'm helping my little brother prepare for the eleven plus, and will definitely be buying this for him as soon as it's available on amazon!! !